Amanda Plamer returns with an intimate masterpiecs. 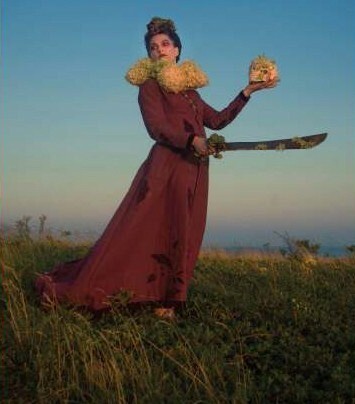 On the cover of her new album, There Will Be No Intermission, Amanda Palmer stands stark naked, wielding a sword. The image (and for that matter, the title) parallels the the album itself. Palmer has never really been one to separate life from art, but Intermission takes things to a whole new level. It’s billed as her most personal album to date—and it’s easy to see why. A lot has happened to Palmer since her last solo effort, 2012’s Theater Is Evil, and much of it—losing a close friend to cancer, having an abortion, being misunderstood by the media, not to mention bearing witness to the atrocities that all of us have seen under Donald Trump— wasn’t pretty. In the press release I was sent with the album advance, she is quoted as saying, “This isn’t really the record that I was planning to make. But loss and death kept happening in real time, and these songs became my therapeutic arsenal of tools for making sense of it all.” So Palmer isn’t just naked literally on Intermission but also iguratively. She bares her soul.